Born in San Diego and raised in Spring Valley, Suarez – a first-generation American – grew up in a household of modest means. He recalls being treated as less than exceptional by his peers and being bullied and the target of name calling as a youth. A graduate of Monte Vista High School, Suarez has been attending Cuyamaca College since 2013. He changed his major more than once before settling on political science and sociology, and his long-term goals include going to law school and becoming an environmental attorney. Cuyamaca College, Suarez said, has been a perfect fit. Cuyamaca College faculty and staff are glad he’s here. Those attributes were among the reasons Suarez was selected as a DREAM scholar. The year-long experiential program is aimed at enhancing leadership, critical thinking and networking skills, and scholars were invited to share their experiences at the Achieving the Dream conference in San Francisco. “You can summarize me and what I am passionate about with one of my highest held beliefs, which is that I think that when we give up and say your dreams are not worth pursuing because the obstacles seem insurmountable, that’s when we have truly lost,” he wrote in his Achieving the Dream application. Suarez’s involvement didn’t begin at Cuyamaca College. 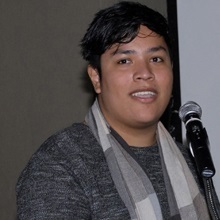 Active in the LGBTQIA+ community and passionate about equity in education, Suarez said a pivotal moment in his life came in high school while participating in a winter carnival hosted by One.org to benefit shelters in Tijuana. He’s been busy doing that at Cuyamaca College.